Pictured at the office of Senator Charles Schumer (l-r) Union leader Terry O’Sullivan, Fiachra McGuinness, Senator Schumer, Emmet McGuinness, and Marty Glennon of the Brehon Law Society. 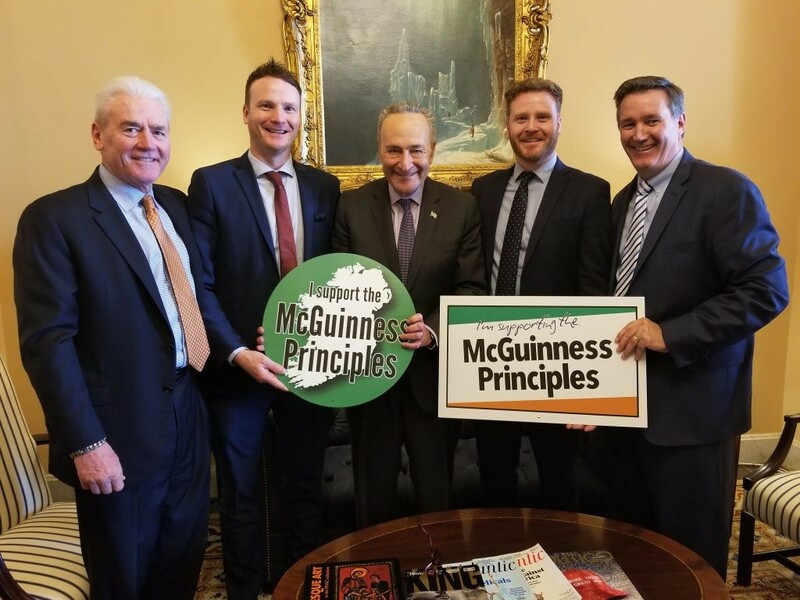 The campaign behind the newly minted McGuinness Principles received a double boost this week with backing from Senator Charles Schumer and a packed New York City launch Thursday evening hosted by New York State Comptroller, Tom DiNapoli. The gathering, at Hunter College’s Roosevelt House, was attended by the sons of the late Martin McGuinness, Emmet, and Fiachra. On Wednesday, the McGuinness brothers and representatives of the Ancient Order of Hibernians and Brehon Law Society had met with Senator Schumer at his office on Capitol Hill. After the meeting, Schumer issued a statement supporting the four principles, which call for a bill of rights for Northern Ireland, full statuary equality for the Irish language, equal justice for all victims of the conflict and their families, and a referendum on Irish unity. “The McGuinness Principles is the roadmap all parties should follow to fully realize the promise of the Good Friday Agreement, and achieve full equality, lasting peace, self-determination and all-Ireland prosperity,” Schumer said in a statement. At the Thursday evening launch – which came after a first unveiling of the principles last week at the Irish Studies Institute at Molloy College on Long Island – tribute was paid to the late Martin McGuinness in words, and by way of the screening of a film in which McGuinness, shortly before his passing last year, looked back at his life and work. Also lauded as a special guest honoree was actor, author, and raconteur Malachy McCourt. DiNapoli, who oversees New York State pension funds, and that portion of the funds invested in companies doing business in Northern Ireland, said that Martin McGuinness had been a “great, great hero,” and that his “relentless leadership” had helped transform Northern Ireland. He said that adopting the McGuinness Principles would be the “right thing to do” and would help improve the investment climate in Northern Ireland. The McGuinness Principles were key in terms of taking the next step, DiNapoli told his audience in what is the home of Hunter College’s Public Policy Institute and the former family home (from 1908 to 1933) of Franklin and Eleanor Roosevelt. And that was being a warrior, a visionary and a revolutionary. “It’s up to us to finish the job with the McGuinness Principles,” Mr. O’Dowd said. Fiachra McGuinness said that the Good Friday Agreement had not been fully realized and was not reaching its potential. Brexit, he warned, would effectively tear up the agreement. “Our family believes that by supporting the McGuinness Principles you can achieve the objectives and hopes our father worked so hard for during his life,” he said. Jennifer Frankola Crawford of the Brehon Law Society said that all at the gathering had come together to mark a milepost in a journey, and to set a new course. The McGuinness Principles, she said, were a call for the delivery of the promise of the Good Friday Agreement. Sean Pender of the Ancient Order of Hibernians said that more than hope was needed to secure full implementation of the Good Friday Agreement. The McGuinness Principles, which threatened no one, would be supported by a coalition of organizations and Irish America with a view to seeing the full implementation of the agreement. Mr. Pender noted that the McGuinness Principles had been read into the Congressional Record by AOH National President, Judge James McKay, during a recent hearing in Washington chaired by Rep. Chris Smith (R-NJ). The gathering heard appeals for help in growing a grassroots movement in support of the McGuinness Principles, a movement that would be seeking political support and supportive legislative resolutions in the days ahead.